Well that was an entertaining finish to an entertaining international break. Read all about tonight's games by following the links below. Scroll down for the reaction. Republic of Ireland manager Mick McCarthy, speaking to Sky Sports: "I lied on Saturday [saying he hated every minute of the win over Gibraltar]. I loved the national anthem, standing for that, I loved our goal and I loved the final whistle. I didn't hate everything. That win gave us momentum, that horrible 1-0 win, but tonight was a 1-0 win of a different ilk. We played really well tonight. We could have put two or three past them. "We negated their style of play. The lads worked an unbelievable shift and played really good football. We created opportunities and unfortunately didn't take them but we didn't let them in so one goal takes it." On the fans' protest moments before Conor Hourihane's goal: "It didn't affect us. When things like that happen you have to really concentrate. I was conscious we didn't take the free kick and get done on the break. It didn't happen. Whatever was to happen it wasn't stopping that free kick." On the draw between group rivals Switzerland and Denmark: "Switzerland were 3-0 up too. They are a very good side but maybe took their foot off the pedal. The top two could cut each others throats and allow us to pick up points. I think we should just concentrate on our two wins." Mick McCarthy's voice was going as he just spoke to Sky Sports after the game. He sounds like he'd done a fair bit of shouting tonight but was delighted with his team's performance. Italy and Brazil both won tonight. Italy thumped Liechtenstein 6-0 in Euro 2020 qualifying Group J. They are top of the group with two wins from two. Brazil fell a goal behind in their friendly against the Czech Republic but turned it around to win 3-1. Roberto Firmino scored once and Gabriel Jesus twice. More from Aidy Boothroyd: "Germany are a good team. We have to adapt to that and be good enough to overthrow them. We were a little bit tentative in the first half. In the second half I was much more enthused by what we did. "This could be a real positive. I would rather lose this game than one in the Euros. As disappointed as we are, it's one we have to learn from. "Dominic Solanke's goal got us going. I am really pleased for him because his work off the ball was terrific tonight. He made some good runs and got what he deserves. He has been in this system for a long time. He is just getting his career going again at Bournemouth and I think he will flourish." On Phil Foden's performance: "We couldn't get him on the ball in the first half but when he gets it in those pockets, he isn't giving it up. "He has a lovely weight of pass and he has so much talent. The more he plays with us, the better he will get. No doubt about it. In an ideal world, he will get in the first team and he is good enough to do that which is why Pep Guardiola has put him in there. If he gets his games and plays like that, he will get more chances." England U21s captain Dominic Solanke speaking to BT Sport: "That's football. You won't win every game. We have been on a fantastic unbeaten run and we will take all the positives and negatives from the last two games and take them into the tournament [European Championships this summer]." There have been some crazy games tonight. In the 'Scandinavia derby' Norway were 2-0 ahead after 60 minutes before Sweden scored three goals to go 3-2 up, including a 91st-minute goal which looked like a winner. That wasn't the end of the drama though with Ola Kamara grabbing an equaliser for Norway in the sixth minute of stoppage time. That's as well as the 3-3 draw between Switzerland and Denmark. England U21s manager Aidy Boothroyd speaking to BT Sport: "We are disappointed because we want to win every game we play. We tried different things and I saw a lot of positives. It was a good test for us. It was two good teams having a go at each other. "I thought Phil Foden was exceptional and it was nice to see Dominc Solanke get on the scoresheet again. They came out the traps quicker in the first half but to lose that goal at the end hurts. It's a horrible loss but we have to look at the positives. "There was a head injury. I'm looking and thinking you have to stop the game. We're disappointed. If it's a terrific goal then you hold your hands up but it was a scrappy goal, in a friendly and the referee should have stopped play and awarded us a free-kick." Spain have six points from six after following up a narrow win over Norway on Saturday with another victory, as expected, in Malta. Although the landslide expected from Spanish fans might not have materialised in Valletta, there will be plenty for Luis Enrique to dissect in his analysis of the performance by a young and experimental side. And that is credit to Malta. The home side, ranked 182nd in the world, battled hard and frustrated their illustrious visitors throughout, with keeper Henry Bonello producing several stunning saves. JavelBleach: Could have won this 4-NIL but instead, they did what they always do & clung to the one goal advantage. That approach will lose them points in the coming games. The win for Republic of Ireland means they now top Group D.
It's all over in Basel. Denmark scored in the 84th, 88th and 93rd minutes to come from 3-0 down to draw with Switzerland. 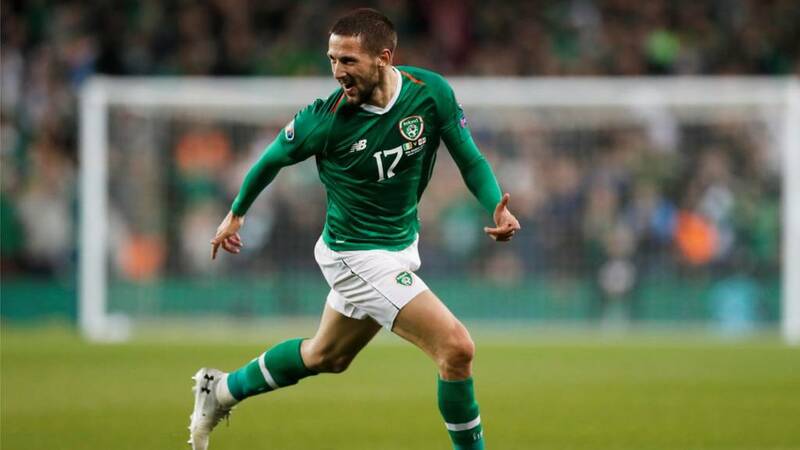 Conor Hourihane's goal means Mick McCarthy has two wins from two at the start of this qualifying campaign. The home fans are whistling furiously. Mick McCarthy waves his arms around to direct his players. Can Ireland hold on for a crucial win? Denmark have come from 3-0 down to level at 3-3 in stoppage time against Switzerland! Ireland are top of the group as things stand! There's no time left for England U21s. Their unbeaten run ends at the hands of Germany. And there'll be four minutes of added time at the Aviva Stadium. We're into the sixth minute of added time due to Walker-Peters' injury. Can England create one last chance? It's all got frantic for Republic of Ireland. Georgia have gone three at the back for the closing stages. Glenn Whelan is telling Darren Randolph to slow things down.